Stop fooling yourself. Sales success is mostly random. Why sales isn’t a fair game and how the best still are able to perform. It’s easy to think that sales is a linear process. Generate a thousand leads, qualify two hundred, close ten, rinse and repeat. Just keep dialing. In a fair world, this would all be good and well. Sales would be easy because everyone would know exactly what to do to increase their sales. Set meetings, qualify and close. Unfortunately, however, the world isn’t fair. Economist Vilfredo Pareto, observed this in 1896 noting that 80% of the land in Italy was owned by 20% of the population. This concept, known as the Pareto principal is often referred to as the “80/20” rule. One thing to remember is that the Pareto principal isn’t really a rule so much as it is an observation. What Pareto found is that for any any one input (houses) there is a disproportionate output (population). Since Patero’s idea is more about the disproportionate outcome, the two numbers don’t need to add up to 100. For instance, 80% of revenue could come from 20% of the clients or 90% of sales could come from 3% of the clients. Conversely, a “fair” world would be evenly distributed. 50% of the sales revenue would come from 50% of customers. A $1M quota with a 10% close rate and average deal size of $100k would need 1,000 leads. Clients, however, are diverse. Some need a generic solution and can only spend fifty thousand in budget others require something more custom and can spend five million. This means that out of the thousand leads in the example above, only a handful will close, but more importantly, even a smaller number will make up the large portion of the revenue that any given sales rep will bring in. Identifying the correct prospect to spend time with earlier gets even more important when, according to a 2013 CSO Insight Study, 20% of new customers are on a one year sales cycle. 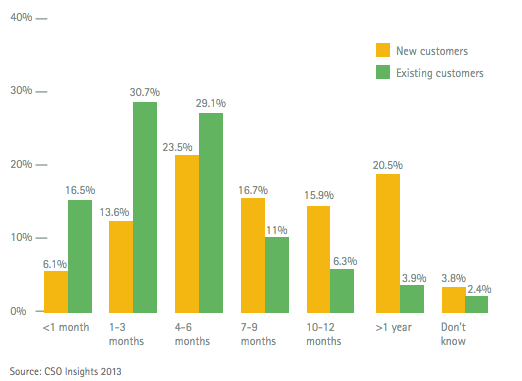 The same study indicated that 23% of leads come from existing customers. Since there are only a small number of clients that will generate the most revenue in the world there is a certain amount of luck that goes into meeting them in the first place. Even if the sales rep does meet the right person at the right event, follows up with the prospect at the right time, sets up an intro call during a time where the lead is most receptive and so on, there are so many things that can go wrong and blow up a deal. Many sales people throw their hands up in frustration and begin looking for some reason that the top sales people are successful. Frustrated sales reps buy books, visit the seminars, hire coaches, all while believing the narrative that sales success is “just around the corner”. After some education if they still are not successful, they start to blame the product or service that they sell. “If only the we had x feature” becomes their mantra because at the end of the day they are looking for a magic bullet to make the pain go away. The problem isn’t just localized to sales people. Managers can also set off on a quest for the magic bullet. They bring in trainers or motivational speakers, hold sales contests, etc. Managers try whatever they can do to help improve the output of their team thinking that there must be some lever or button that can be pressed to get more sales. The problem is that there really isn’t a magic bullet that will help close more sales. What separates the killers from the rest of the flock isn’t the gift of gab, its the understanding the randomness of sales and their lack of total control over the situation. Accepting this fact allows for top earners to focus on maintaining a certain level of preparedness as they hustle. The top sales people stay very active. They provide value outside of their companies immediate offering. They do the dinners, get on the planes. Day in and day out they grind, always keeping their eye out for a 20% account and when they see one, the strike. Get hand picked travel, business, and tech content delivered to your inbox.